I wanted to gain understanding of how to involve residents of a neighbourhood in a design process through a series of initiatives, referred to as ‘explorations’. These explorations were carried out between October 2011 and August 2012 in Kannelmäki, a suburban area of Helsinki, and formed part of my Master’s Thesis at the Creative Sustainability programme, at Aalto University. My thesis project was linked to Repicturing Suburban Neighbourhood (RSN), a course held as a workshop for university students in Kannelmäki during one week in May 2012. This academic course was part of Aalto University’s 365 Wellbeing initiative, under the umbrella of Helsinki World Design Capital 2012.1 The RSN course was also part of a European collaboration project called TANGO (Towards a new intergenerational openness).2 The RSN course focused on the identity of Kannelmäki and aimed at finding ways to improve the everyday life of its residents. The aim of the course was to revitalise the area in collaboration with the residents. 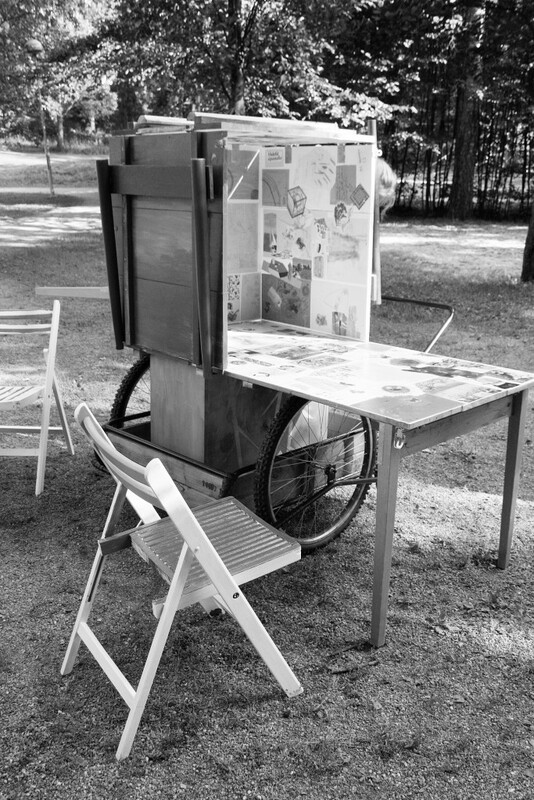 Kuutio, a mobile café © Malin Bäckman. The explorations that I carried out in Kannelmäki build on the idea that sustainability requires collaboration. By bringing people together new forms of collaboration can emerge, which can have positive impacts both socially and environmentally. I asked myself: How can a designer encourage people to take action and improve their own living environment through the resources found within interpersonal relationships? The project builds on the mindset that the purpose of design should be to collaboratively move towards more sustainable ways of living.3 The first step for me as a designer was to gain understanding of how to design with people in a local context, and of the ways in which design can encourage new forms of collaboration. The participation of the residents was crucial in carrying out the process. I considered the residents of Kannelmäki as ‘everyday people who are experts of their experiences’,4 and the aim was to generate an ‘empathic understanding’5 of the residents of Kannelmäki. Each exploration formed a step in a process aimed at exploring the area of Kannelmäki and the residents’ perceptions of their living environment, while finding ways to connect with the community. Another objective was that of exploring designerly ways of creating new social connections among the residents. While I familiarised myself with the area and was trying to find ways to improve collaboration with the residents, I wanted to produce knowledge about how to carry through with a design process in a local social context. Even though many design researchers agree that stakeholder involvement is essential within sustainable design, there is a lack of practice-based examples, especially when the focus of the design project is a specific local context. The explorations in Kannelmäki were carried out with the intention to gain understanding of how to put promising ideas from the field of sustainable design into practice. Kuutio, the cube, is a mobile café that visited several locations in Kannelmäki during August 2012. This project was the last of seven explorations that I did during my thesis project. The purpose with Kuutio was to create a project in collaboration with the residents, in the spirit of a community effort, where the creation of the project could bring people together and create new social contacts within the area. The reason for choosing a mobile café, was to create temporary, informal meeting places in the area. Bringing the cube to specific locations would highlight the place, create unique interactions and bring it into a different light. During the course Repicturing Suburban Neighbourhood, I got familiar with Tuula Mäkiniemi, an architect student from Aalto-university. 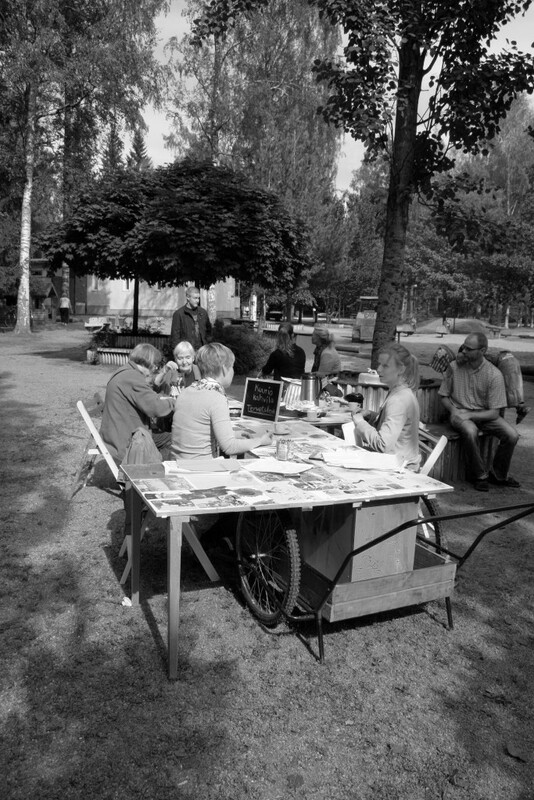 Mäkiniemi and I had similar ideas about building something physical together with the residents in the spirit of a community effort where the construction could serve as a social space. We decided that Kuutio would be installed in Kannelmäki for approximately one week in August 2012. Temporary meeting places would be created in the places visited by Kuutio and in each place there would be a trace left, to show that the cube had been there. Those visiting the café could leave messages and works of art in the café, resulting in modifications of the cube throughout the week. The original intention was to build the cube as a mobile kiosk that could fold out as a ‘terrace’ in collaboration with the residents. However, it became evident that the physical construction was not as important as the intervention of the cube and the event itself. So, we designed the cube as a foldable coffee table on a two-wheeled barrow. The surface of the table was designed so it could be modified by the café’s visitors throughout the week. We wanted to let the residents of Kannelmäki know that something was about to happen, but we decided to start spreading the word without giving too much away about the project. We set up a blog with basic information about the cube and we advertised the project by spreading paper origami cubes with the blog address attached around Kannelmäki. The cubes acted as flyers and aimed at catching people’s attention and curiosity. Posters were also distributed around the area, informing that the mobile café Kuutio would arrive in Kannelmäki in August. Prior to the event we contacted several different actors that supported us in different ways during the event week. The café keeper in the cultural centre of Kannelmäki, let us make coffee in her café and we got permission to keep the trolley with the cube in the lobby of the cultural centre in-between the events. The recycle centre Kierrätyskeskus supported the project with a small sum which enabled us to use their recycled materials, including bookshelves and legs from old tables. A key strategy in the actual event week was to piggyback with other events or happenings already scheduled in the community. During the opening the cube was painted in public and by-passers were invited to participate. Some by-passers were curious about what was going on, while others were not too eager to participate. Some people approached us spontaneously with questions about the cube, but there were also many who did not dare to ask anything, instead they observed the painting operation at a distance. Others already knew about the project, as they had either seen the posters or the cube in the lobby of the cultural centre. They approached us in order to get additional information. 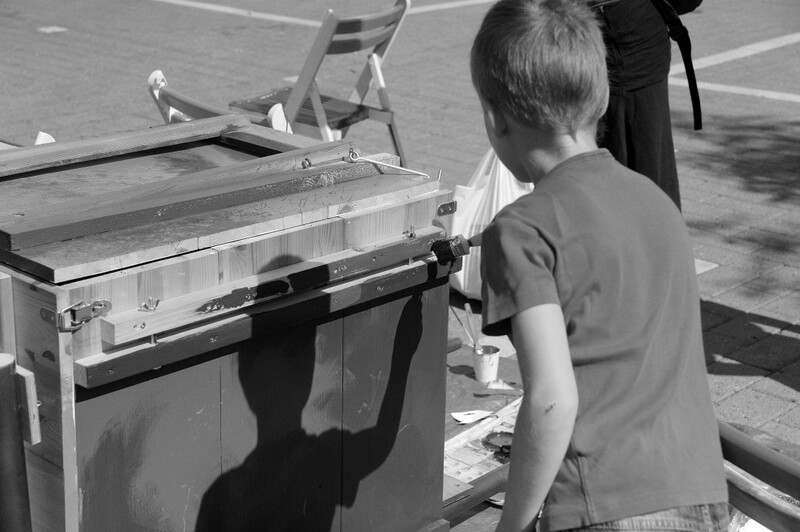 Painting Kuutio in public. © Pyry Nousiainen. Taking advantage of the renowned Restaurant Day event6 Kuutio was set up in three different locations in Kannelmäki. 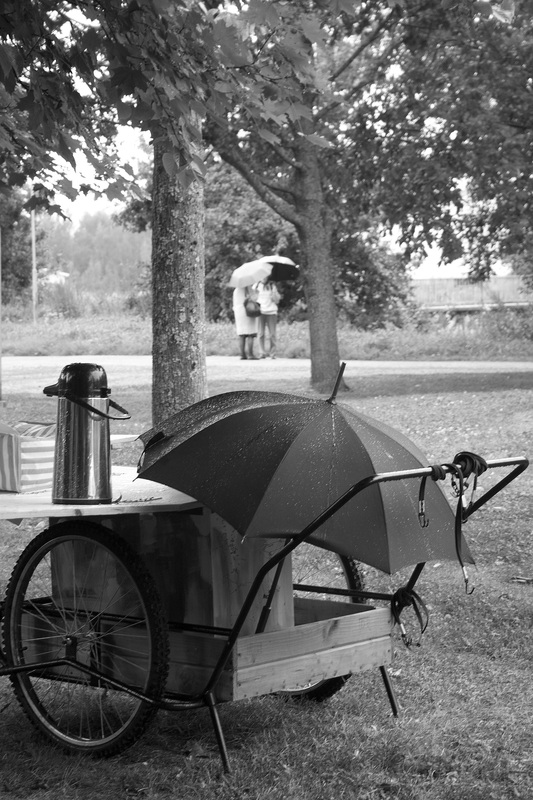 The first spot for the café was in a park area, in-between houses, with trees as shelter from the rain. There were only a few customers at the first location, most likely due to the weather. When Kuutio arrived at the second spot, there were already a few young customers waiting for the café to open. The last spot of the day was at a terrace by a small river passing through Kannelmäki. During the visit at the terrace the café got several visitors, most of them had received the information through the webpage of the Restaurant Day, where the event had been registered. Kuutio was taken to a service house for the elderly in Kannelmäki. We had contacted the service house beforehand, and we invited a group of children from a kindergarten nearby to the service house. The elderly and the children were first told about the project, and then invited to draw pictures and messages that were attached to the table surface of the cube. This is the date for The night of the Arts,7 an annual event when there are art and cultural events all around Helsinki. We had planned to be at the terrace by the small river passing through Kannelmäki, where we would have a workshop where people could make origami boats. The boats would be put to float on the river. Due to the inclement weather we agreed with the cultural producers of Kanneltalo, that Kuutio could be in the lobby of the cultural centre and we would participate in the cultural centre’s event instead. During the evening people were invited to leave artworks or messages that were attached to the table surface of the cube, they could also learn how to make origami cubes. During The night of the Arts people were told about the project and encouraged to visit the last event day, which we called finissage, which would take place the following weekend. The day before the finissage a surprise visit was made to the terrace by the river, with the intention of making the origami boat installation, which had not been possible to realise the day before. The weather was, again, quite inclement, so we couldn’t make the paper boats to float down the river. However, there were a few visitors and good conversations by the coffee table. Kuutio during the Finissage. © Malin Bäckman. Throughout the week the residents could leave suggestions on where the last visit of Kuutio should take place. One of the suggestions was the playground located close to Kannelmäki’s church. The Kuutio café was set up at a crossing of pedestrian roads beside the playground. The weather was sunny and quite warm so there were people walking by the café throughout the day. Most of the people who stopped by, happened to be out walking or were on their way to the playground, but a few had followed the track of the café with the help of the posters and the blog, and had explicitly gone out walking in order to visit the café. While drinking their coffee the visitors were looking at and reading the different messages left on the table and many of them also made their own artworks. We were curious to see in what ways the residents of Kannelmäki would relate to the cube and whether it would be possible to create temporary meeting places. Many of the choices made both during the planning phase and during the realisation were combinations of thoroughly planned ideas and pure coincidence. Everything did not go exactly as planned, but serendipity and being open to it, was one important character of the Kuutio project. Similarly, as in the whole series of explorations that I did in Kannelmäki, the intention with the Kuutio project, was to let the situations and the people who happened to take part in the events in order to shape them. During the week we noticed that many of the café visitors had seen the origami cubes and posters that were put up in the area during the summer. When the origami cubes were spread, passers-by asked about the cubes and this served as a possibility for us to tell the local residents about the upcoming event and spread the word about it. When we walked through Kannelmäki with the trolley we got quite some attention, but only a few people asked what the cube contained. When the coffee table was unfolded we could noticed the same thing, people approached the café mostly when we were active ourselves and welcomed passers-by to have a coffee. We realised that clear signs close to where the table was unfolded, where it would be said that Kuutio is a mobile café open for everyone, would have been a way to make it easier for passers-by to approach the café. Even though the first plans for Kuutio were simplified and all of the events were not carried through exactly as planned due to weather conditions, we were satisfied with the project. Most of the people, who either came to drink a cup of coffee, talk for a while or paint the cube, were very positive and encouraging towards the project. By testing the idea in practice we could see that informal meeting places are possible to create by bringing something out of the ordinary into the area. One of the main ideas with the project was to bring people from the area together. By collecting the artworks and messages which would later be visible to others who came in contact with Kuutio, these engaged others in the project. The help we got from various stakeholders in the area made it easier for us to carry through with the project, while the different stakeholders served as channels through which we could reach local residents. A way to ensure that there would be visitors and participants at the events would have been to get a certain group involved in the project in an early phase. This could also have strengthened the feeling of ownership among the residents. But the way the project was carried out did not link the project to a specific group in the area, which can be seen as a way to reach an audience as wide as possible. While exploring how to carry through with a design process where the goal was to design with people rather than for them, an additional motivation was to contribute to the changing notion of design. The area of participatory design approaches has potential to create opportunities for diverse actors to collaboratively articulate the issues that should be addressed within sustainable development on a local level. When seen from a design perspective, designers should collaborate with people outside the design profession more actively, but also with each other. Designers can and should learn from each other, and consider not only sustainability but also the development of the design field as a collaborative effort. Each initiative taken within the local social context can produce new design knowledge,8 while serving as an example for the rest of society of how design can act as a way of catalysing the potential that exists within a neighbourhood. There is most certainly not one single way to carry out a participatory design process in a local social context. With the explorations done in Kannelmäki the aim was to get to know the area based on the residents’ perceptions, then find issues that could be improved according to the opinions of the residents and finally, in collaboration with the residents, take action to change the current situation. Based on the explorations I have outlined a set of guidelines, as a suggestion to how a similar design process can be approached. One important aspect within the guidelines is to approach the residents step by step. The relationship between the designer, or the design team, and the residents should be given time to develop. Involving people in a participatory design process concerning their living environment requires trust, to be built between the designer and the residents. It also requires flexibility and openness to respond and adapt to events and situations throughout the process, and sensitivity towards the opinions and attitudes of the residents. The guidelines include aspects to be taken into account, and serve as a set of practical advice for the designer when carrying out a participatory design project in a specific area. Kuutio on Restaurant Day. © Anja-Lisa Hirscher. The process will have to start somewhere, but it can be challenging to take the first step. So, it is best to start with a simple effort where the designer can begin by sensing the area. When the very nature of the design project is articulated in collaboration with the residents, the first step will be to get familiar with the context by spending time in the area while mapping different resources. Small actions can generate encounters with local people who can provide the designer or the design team with relevant information. Each encounter with local people, be it based on pre-arranged meetings or spontaneous encounters in the streets, will help in getting to know the area based on the residents’ perceptions. The residents are the experts of their neighbourhood, so the context within which the project is to take place will best be understood by listening to the opinions of the residents. Listening to the opinions of the locals makes it easier to understand what it is like to live in the area, and its strengths and weaknesses. Creating connections and building trust takes time, the earlier this process is started the easier it will be to involve local people further on in the project. Considering the residents as experts within the design process helps in getting to know the perceptions of the people who live in the area and also makes it easier to involve them in the design process. If the residents are considered to be the experts it is more likely that they will take ownership of the design process, than if the designer considers him or herself as an expert. Being on an equal level with the people one is working with, and stepping out from the comfort zone of being the designer/expert is essential when working with people in a local setting. Local key people are a valuable resource both in the beginning of the process, whilst getting to know how things in the area work, and further on as a link to other residents. The key people are active individuals often involved in associations and projects in the area. By connecting with key people it is easier to build trust with other community members as the active individuals usually have good social networks within the area and are considered reliable. Therefore being introduced by a local key person makes it more likely that residents will be interested in getting involved in the design project. Even though the designers’ role is continuously changing, people outside the design profession often see designers as professionals who are focused on designing products or planning the built environment. When the intention is to collaborate with the residents and find propositions for improvement, it is important to explain this clearly already at the beginning of the process. When carrying out a design process in a local social context the designer might only act as a facilitator, aiming at encouraging participation even if the outcome is not necessarily anything tangible. The more one has reflected upon one’s own designer role, the easier it will be to explain this role to the people encountered throughout the project. Through various forms of visibility one can attract people’s attention and let people know about the design project in question. Posters are a common and easy way to distribute information, but more surprising methods can be beneficial. Curiosity about surprising things in the neighbourhood can attract residents’ attention. Sometimes strangeness can be a positive way to provoke discussion with and among the residents of an area. One of the designers’ special skills is creativity. Making interventions to attract attention are often an effective way of engaging people. When setting up an event where the aim is to reach the residents, start with a place where people frequently go, even though this place might be associated to certain values or visited by a certain group of people. Approaching people at a place where they usually spend time will be much easier than trying to invite people to a location they do not normally visit. Keep in mind that only a certain type of people is likely to be reached through a certain types of events. Trying different places is beneficial if the aim is to connect with a wide variety of people from within the neighbourhood. When entering an area and approaching people they will most likely ask what the project is about, so be prepared to shortly and clearly explain who you are, why you are in the area, what are your main intentions and the key aims of your project. Even though it is beneficial to remain open, and let the residents’ opinions guide the process, the people you encounter will most likely appreciate and more willingly collaborate if you can give them a coherent explanation about the aim(s) of your project. When gathering data and getting to know the residents’ perceptions it is useful to bring activities to events that will benefit the participants. Gathering data is through interviews, or running a workshop, can help satisfy those who participate. For example, a workshop can be a way to bring residents together to address a common concern, to create new connections and, at the same time, have an enjoyable time. Give the results back to the interviewees and participants, so they can learn from the activity. Try different approaches throughout the process to reach different audiences. Approaching people on the street, setting up an event or meeting the same group of people several times are all very different ways of collaborating with the residents and serve different purposes. Preparing different ways of taking part in the activities, for example, through visual means, writing or discussion, gives everyone the possibility to participate. By openly communicating and demonstrating the nature of the project, the residents have the opportunity to follow the development of the design process. This can be done for example through a webpage or a blog, where the design process, efforts and reflections are updated throughout the process. In this way people can learn about other residents’ perceptions of their area, comment or get involved in the project. It is also worth considering ways to demonstrate the design process offline, since all people do not necessarily use online platforms actively. Being flexible is crucial as it is hard to foresee how things will go. Openness and flexibility help involve the residents in the process, by letting their ideas guide the process. Unexpected things happen, so try to adapt and have a back-up plan or strategy. Try to turn the unexpected into something that benefits the process. While finding out attitudes and ideas for improvement in an area, one way to get people to take action to improve their living environment is to show examples. Initiating an intervention where something is improved, even temporarily, can inspire residents to take similar initiatives. Each action performed can lead to new sets of actions. When creating a suggestion for how to improve the area, it is beneficial to identify and involve existing local resources. This is a way to highlight strengths in the area and can facilitate new connections among existing resources. Involvement also creates a feeling of ownership among the residents which helps sustain the initiative. 3 See, for example, Manzini, E., 2007. Design research for sustainable social innovation. In: Michel, R. ed. 2007. Design research now. Essays and selected projects. Berlin: Birkhäuser. pp.233-245; and Fuad-Luke, A., 2007. Re-defining the purpose of (sustainable) design. Enter the design enablers, catalysts in co-design. In: Chapman, J., Gant, N. eds. Designers, visionaires + other stories. A collection of sustainable design essays. London: Earthscan. pp.18-55. 4 Sanders, E. B. N., 2006. Design serving people. In: E. Salmi and L. Anusionwu., eds. Cumulus Working Papers 15/05. Cumulus Conference on Future Design and Innovation, Copenhagen, 23-25 September 2005. Helsinki: University of Art and Design, Publication Series G, 2006. pp.28-33. 5 See, for example: Vaajakallio, K., 2012. Design games as a tool, a mindset and a structure. PhD. Aalto University School of Arts, Design and Architecture Helsinki: Aalto ARTS Books. 8 Ezio Manzini stresses the importance of producing new design knowledge in order for design to change direction towards sustainability. Manzini, E., 2009. New design knowledge. Design studies, 30, pp.4-12. 9 These guidlines were first presented in Bäckman, M., 2013. Explorations in Kannelmäki. Building design knowledge through practice-based design research. MA. Aalto University.